So spring is finally really here in Maryland. Uh, isn’t it? That 80 degree weather in April sealed the deal didn’t it? I don’t think cold weather can zap us again with a near freeze…in May…well, merely 40s. Yikes. What a strange year we have been having. Looks like the cherry blossoms escaped that last frost (at least in our yard), and see! HOORAY for this greenhouse structure Edward put up (with help from Oskar)! Right now it holds agricultural fleece above the lettuce and greens to protect them from that hot weather we had…(can you remember?) It will stay up year round, covered in plastic sheeting during cold months to extend out lettuce and greens production as far into the winter as we can. So many of my ideas never achieve reality (I know. I have too many.) It is pretty satisfying to see one up and working. 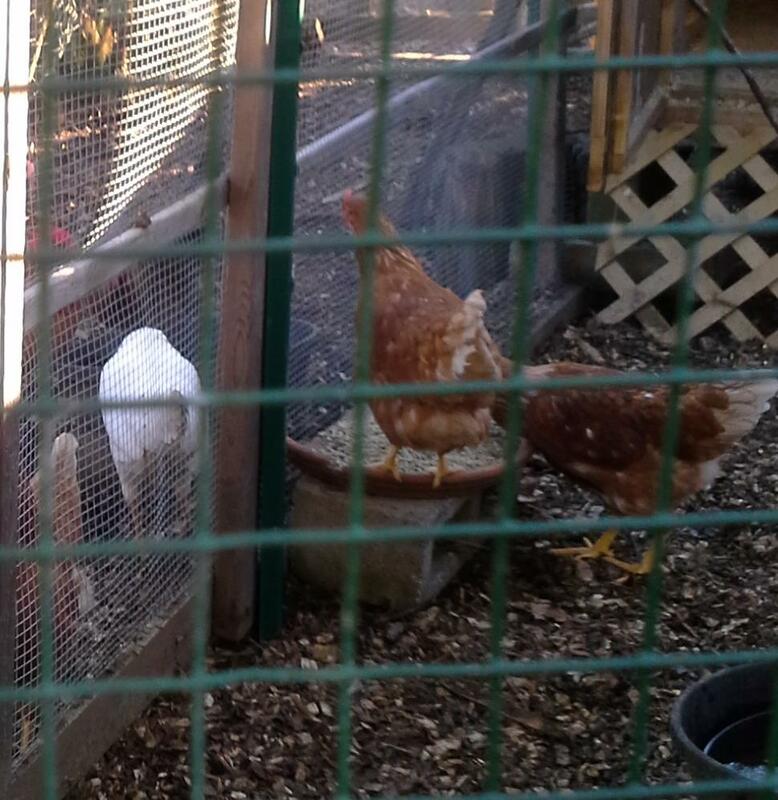 What this means to the suburban grower though is a chance for an adoptive mother to raise a couple new chicks. I did it once before with success. But I don’t have the space for two mamas to raise chicks in the privacy needed — in nature they like to go off alone into the brush or a corner of a big farmyard. So I discouraged the Golden Maran, and encouraged the Buff Orpington. This wasn’t easy. I moved her three times trying to convince her that the broody box in the little coop was a better place than the nesting boxes with all the other hens. There is no way that a hen can raise chicks safely with the other hens around – they would be attacked by the other hens as interlopers. 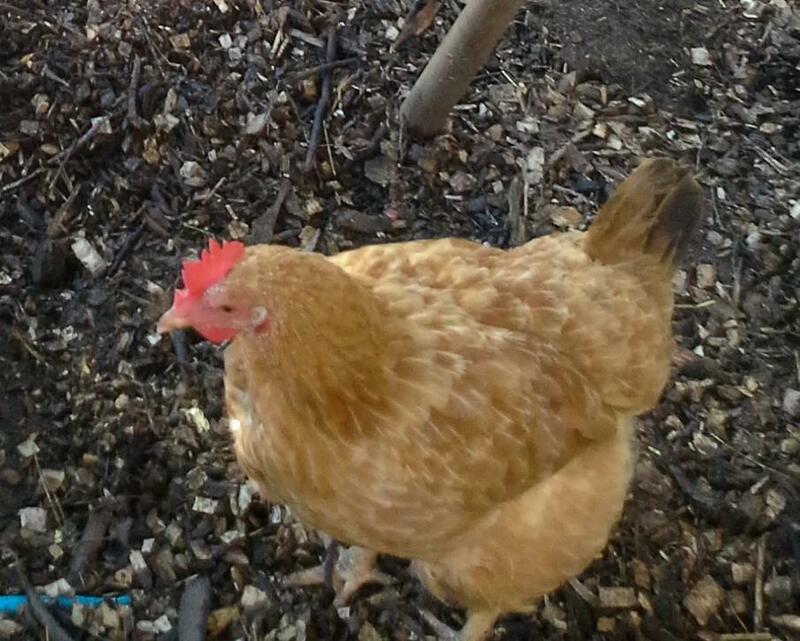 But most broody hens have about half the required instincts – they don’t isolate themselves. So I did my best. Finally, after some more research online, I moved the warm eggs first to the new location, and then took her, struggling and resisting, to sit on her eggs in the new spot. This time I remembered to close the door, so the other hens couldn’t bother her. And there she stayed. Three days later, I picked up 5 one day old chicks from a local feed store – and Edward (who kindly accommodated this errand while on his way back from a medical procedure) agreeably held the box in his nice warm hands. 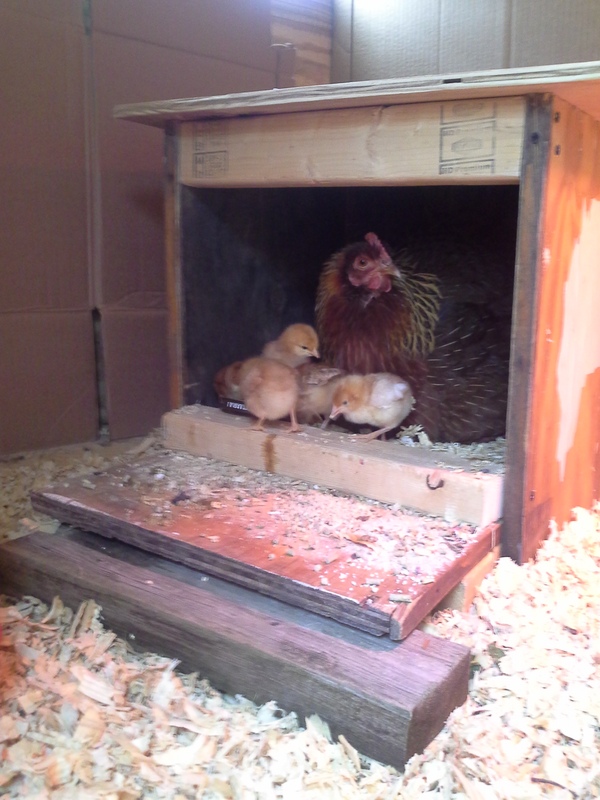 Once home (and my ailing husband settled) I threw the chicks into a warm oven and scurried around setting up a temporary box – we had to wait for night to make the switch. It was hard not to worry. This night would be the night that the previously warm weather turned cold again! 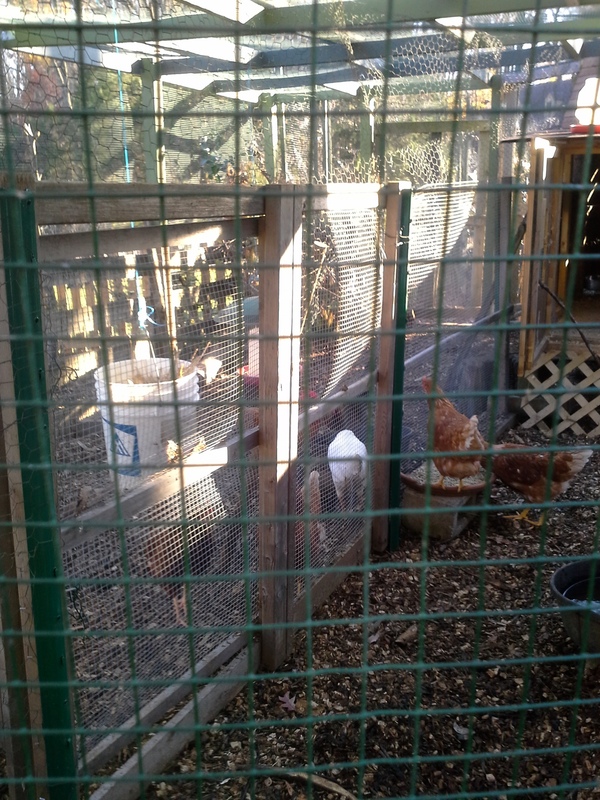 Fifty degrees — and baby chicks like 90. That night I carried the box of them out, and by cover of darkness I slid the hot eggs out from under the broody Orpie and slid the panicked, peeping chicks underneath. I had to shove one little guy under twice – she seemed frozen. All the next cold day I didn’t see or hear a peep. But the hen was all puffed up though over top of them. That was hopeful. She looked…surprised. Next morning I pushed a flat dish of food and then water up close to her chest, and she ate and drank avidly. Prior to the cold snap, the weather had been very hot and she had been brooding for weeks, hardly leaving her nest for food or water. Then she pulled away. She wanted me gone. So I went away, hoping that young and inexperienced as she is, her instincts would tell her that those babies need to eat and drink too, somehow, despite the cold. I have doubted this broody hen every step of the way – doubting whether she could sit a nest, whether she would reject these adopted babies, whether she would know to feed them on a cold day! I have been distressed to find that she wants to sleep on the ground under the structure I built for her, instead of inside it. Even after I made a new ramps for the little chicks yesterday to get up into it, they showed no interest. We tried moving her once, which caused extreme distress to her and her chicks and she hid them in a corner. But she is proving herself to be a good mother – and she knows better than I do about the whole process. Last night it went down to the 40s again — but I gave up on the idea of moving her into that nice little coop, and just piled pine shavings around her to help her hold her heat. She did not object. This morning I opened the top of that little coop to get something out, and noticed that the temperature in there was a lot colder than the air temperature in the run outside it. Ahh. I see. That little house was colder than the ground. Being wood, and drafty, it holds heat more poorly. Yep – I guess she knows. Tadumm!! WOW!! The garlic is UP! – isn’t it beautiful? Could it be that last fall’s kale will over-winter and start up again in spring? And look at the mint, all ready to go! Now it’s time to — get paper and make garden plans. B) how to put up as much food from our garden as possible. “Putting up” means canning probably, as well as the dehydrating and freezing that are easier. That will be next fall’s job. I know I can capture more than I do. Did you catch my re-posting of Shannon Stronger’s blog post on canning? (She’s inspiring – here – Nourishing Days ) This means next August I will have to face something I am very afraid of: the pressure cooker canner. Got one at a yard sale, and there it sits. I may ask Mary, the accomplished older lady who used to own it, to come over and give me a lesson. I am truly terrified of this thing. I feel like I will mess up and it will explode. Silly. But long before the pressure cooker canner, we have to start growing the food. Thanks to you all this is actually a lot clearer than most of the sketches I hand to Edward to explain myself when I have a “vision.” So – now that we have envisioned it, all that is left is to actually build it! Oh, that. I guess I had better get out there locating stakes and plastic sheeting. How Does Your Muscle Grow? So friends, ’tis true, your garden beds are bare. But there is something that we gardeners can still be growing — even in this dark and dreary, un-gardenable season. You don’t even have to go outside to do it. Yes, I thought, as I huffed through a plank (yes one plank) this morning, this is the best thing I can do right now to insure a good harvest next season! PLANKS! Eww, sick, I know. But the solid truth is that gardening can be really hard on my bod. During the off season I do a lot more sitting,get soggy in the middle, and have a lot more back, neck, and shoulder pain than in the summer. Unlike some of you athletic people, I was not endowed with a hearty frame. In fact, I’m pretty proud of what this scrawny ectomorph-ic structure has been able to do. Much as I have always hated to see myself as frail, I was a sickly kid. I spent years eating foods that irritate me, being chronically sick, and carrying Kleenex around in all seasons. I could blame my scoliosis (an S shaped spine) for what I cant do – and it is the major reason why the life a real farmer is not for me. But what I do in the garden is great for strengthening me. When I am outside again, hoisting boards, shoveling dirt, and balancing wheelbarrows for a portion of every day, I do better – PROVIDED I have strengthened my supportive muscles. At 53, I am careful about what movements I make (not bending at the waist, not lifting stuff), but it doesn’t stop me much. I believe in creative solutions. Isn’t it tragic though how muscle tissue melts away sans regular use? Sob. Gone with summer’s golden brown tan. So, I am going to advocate – to myself and you – to grow your muscles this winter season. YOU are part of your permaculture! Yes – don’t fuss now – I am planning on a winter of daily yoga and strengthening! !